Tuesday March 29th 1904 Alma brought Mother out this morning. I baked a cake before I got the dinner. We talked all the afternoon. It set in to rain some but they sent for her. Will and I read all evening. Lee's birthday. Wednesday March 30th 1904 It was a rainy ugly day. I did not feel very well. I did the work as easy as possible and sewed some. I read in evening and went to bed early. Thursday March 31st 1904 weather still unpleasant. The boys are busy about the place doing what they can. Levi came back Tuesday morning. I am sewing and busy all the time. 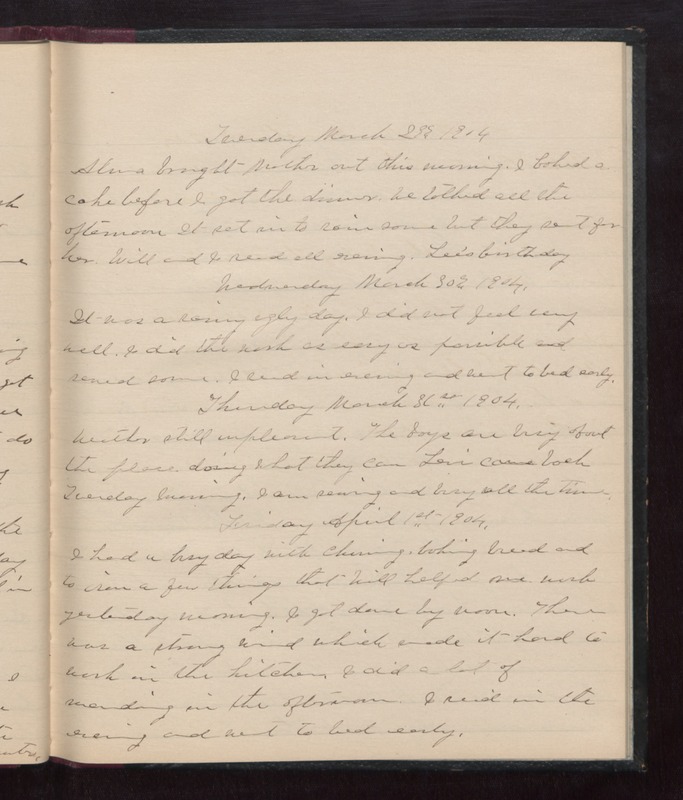 Friday April 1st 1904 I had a busy day with churning, baking bread, and to iron a few things that Will helped me wash yesterday morning. I got done by noon. There was a strong wind which made it hard to work in the kitchen. I did a lot of mending in the afternoon. I read in the evening and went to bed early.